This page looks at ways to improve energy use in the United States and world. 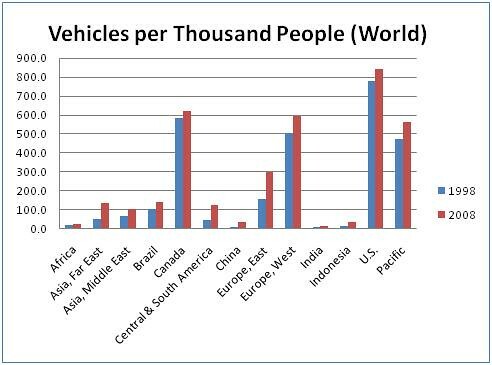 With 780.5 vehicles per thousand people, automobile ownership in the U.S. is more prevalent than in any other country of comparable size. This denotes the global significance of our transportations habits. In this aspect we are the greatest contributor to issues such as depleting resources and environmental degradation which have global effects. As a developed leader in the world’s economy it is imperative to adhere to the highest standards of transportation efficiency. Unfortunately, the United States lags far behind many of its developed counterparts. 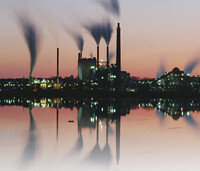 A debate arises between those who believe components such as price and competition will create equilibrium in the market resulting in efficient energy use and those who insist government intervention is imperative to incentivize efficient behavior, thereby, avoiding complete resource depletion and hazardous environmental repercussions. It is interesting to point out the relationship, or lack thereof, between vehicle buyer behavior and the price of petroleum within the last year. 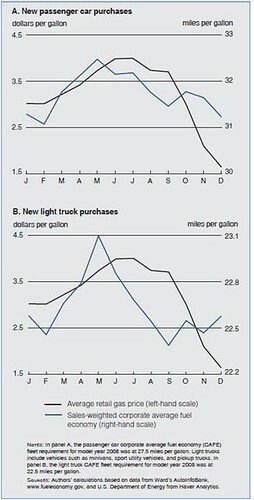 The following graph shows the purchase behavior of cars and light trucks in 2008 when government has already notified the public of new efficiency standards. This data challenges the general assumption under a free market approach that consumers will choose more efficient vehicles if presented with higher prices. It is also possible that consumers will only react to severely high prices maintained for a relatively long period of time. When considering a policy it is important to recognize additional costs affecting the government (tax payers), manufacturers, and consumers. Future benefits must outweight these costs in order to justify implementation. 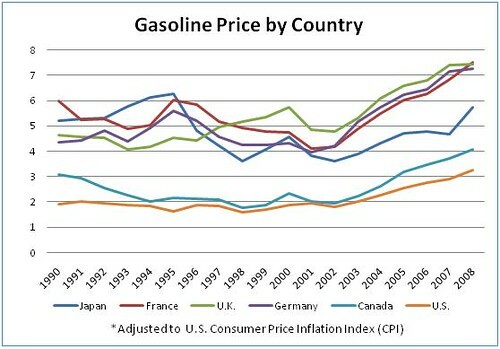 Fuel taxes are by far the most direct and simplest form of transportation energy policy. By taxing fuel we assume that markets are competitive, social costs are internalized, and the private consumers by themselves will reach an efficient solution7. Smaller vehicle size in Europe and other countries relative to the United States is apparent. This could be attributed in large part to much higher fuel taxes which cause consumers to internalize the social costs by paying a higher price. 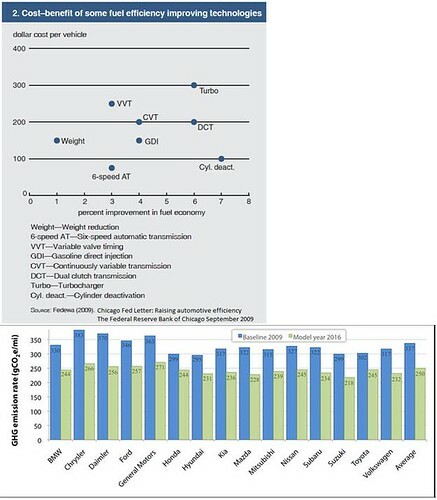 European drivers are much more likely to choose a diesel fueled vehicle as a result of relatively lower diesel taxes. High prices provide a disincentive for fuel consumption, reducing excessive acceleration, speeding, and overall vehicles miles driven (VMT), and in turn reduces emissions. Infrastructure costs for implementing the policy are low and require little capital investment. Despite these benefits, fuel taxes are unpopular among consumer because they dislike paying higher prices. Many economists oppose the idea as well because raising prices can cause an economic deadweight loss, however, much of this can be mitigated is revenues are returned to consumers by reducing taxes. The U.S. Congress enacted the Energy Policy and Conservation Act of 1975 which established Corporate Average Fuel Economy (CAFE) regulations in the United States. 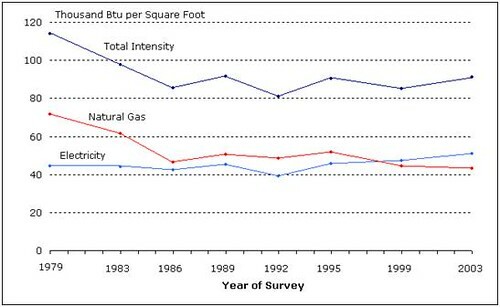 CAFE regulations provide a quantitative target and provide the base for fuel efficiency standards in the United States. Regulations were imposed in response to the oil crisis that occurred in the early 1970’s in an attempt to improve the average fuel economy of cars and light trucks (trucks, vans and sport utility vehicles under 8,500 lbs.) sold in the U.S. Fuel efficiency standards gradually rose until about the mid 1980’s, at this time automakers had met standards for Light Duty Vehicles (LDVs) and the price of liquid fuels dropped dramatically. Little attention was given to fuel efficiency and standards plateued until 2009. As a result, consumer preference for larger, heavier, less fuel efficient vehicles began to increase. 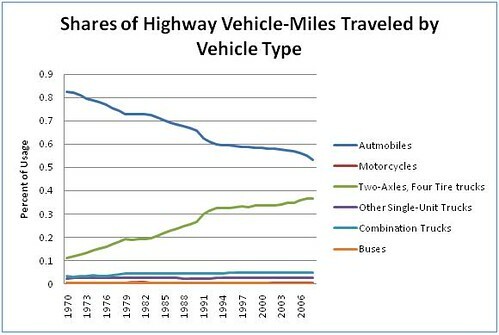 The following graph demonstrates this change, showing a general shift in ownership from automobiles to trucks. Recently, the EPA and National Highway Traffic Safety Administration (NHTSA) have made a joint effort to address automobile efficiency and GHG emissions by creating new CAFE standards, we may refer to them as CAFE 2. The three main objectives of CAFE 2 are energy efficiency, fuel efficiency (MPG) and reduction in GHG emissions. The new changes will include standards for Heavy Duty Vehicles and amendments to existing standards for Light Duty Vehicles (LDVs). They apply to passenger cars, LDVs, and medium-duty vehicles and will require an estimated average emissions level of 250 grams of carbon dioxide per mile by year 2016. 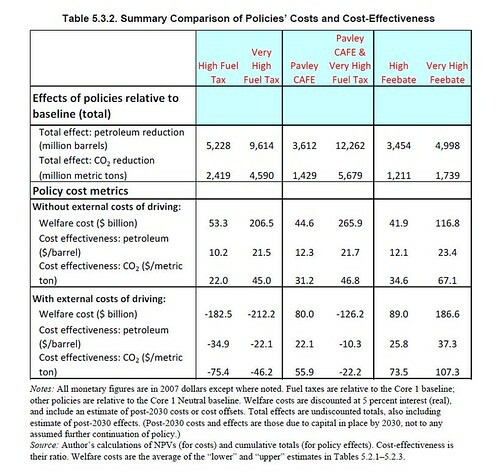 This equivocates to 35.5 miles per gallon; however, miles per gallon may vary if additional carbon reducing changes are made such as more efficient air conditioning systems (see cost benefit graph for other technologies)10. 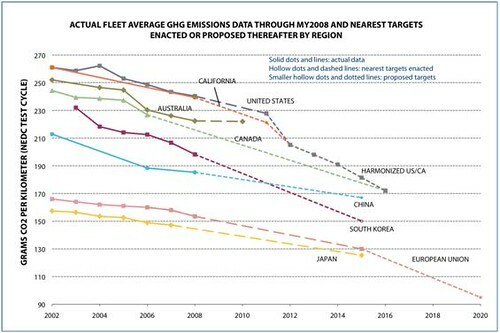 The following bar graph compares 2010 GHG objectives with current 2009 vehicle models. In contrast with the first CAFE, both LDVs and HDVs are expected to adhere to standards of maintaining a small “footprint” so vehicles of the same size do not compromise safety to achieve fuel efficiency by encouraging the use of light-weight materials while maintaining vehicle size. By using the footprint method, selling more small vehicles does not help manufacturers meet footprint standards. It is important to note the incentive for lighter vehicles on the grounds of safety concerns. Some technological advancements are necessary to reach efficiency standards while maintain current safety rating. However, larger vehicles are only safer for its occupant not for anyone colliding with it12. 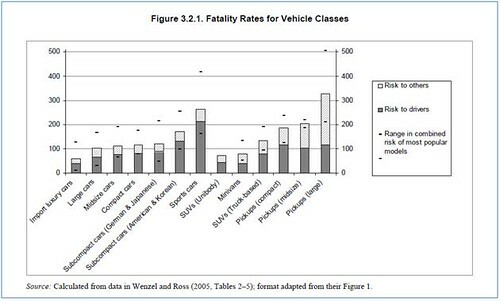 In fact the overall risk (including risk to others) is generally higher with larger vehicles. Another main disadvantage is that the policy gives the user no incentive to use other means of reducing fuel consumption, such as limiting excessive acceleration and reducing total vehicle miles drive (VMD). In fact, there is greater incentive for consumers to drive these vehicles because they pay less per mile. It should be noted that all automobile manufacturers do not have to adhere to these standards. Many high end companies such as Maserati, Mercedes-Benz, Jaguar, and Porsche have opted to pay fines14. Consumers internalize the cost of additional fuel intensity (the reciprocal of fuel efficiency) by paying a higher price. This is essentially the idea of a feebate, however, with the feebate method consumers are charged for their inefficient behavior and the money is used to provide other consumers with rebates for efficient vehicles. An efficiency target is established, similar to the CAFE regulation, and is reached by those who chose to the purchase of more efficient vehicles. In a NEMS-RFF study by Kenneth Small, feebates created greater efficiency gains though the use of hybrid and diesel than the CASE standard but it also provides incentive for greater VMD. A fuel tax can be used in conjunction with efficiency standards or feebates would force drivers to internalize some of the social costs and mitigate the disadvantage of inefficient driving. Small conducted an analysis over the combination of these two policies and found results to be more efficient that either policy by itself. The graph below gives an overview of the policies, using the NEMS model. Some have proposed the idea of a usage based insurance policy to a similar effect. General insurance policies charge the fixed amount regardless of quantity of time spent driving. In terms of economics, this means that the person who drives more often and greater distances, the freerider, is benefiting from those who drive less frequently and fewer miles. A usage based insurance policy would internalize the social costs of driving and change overall consumer habits. With government rebates and feebates, the additional initial cost of fuel efficiency is paid by the government and inefficient consumers; some would say the manufacturer as well. However, consumers can still benefit from efficiency without the help from government policies. The present discount period value and payback period are essential in determining when the buyer will receive benefit rather than loss from the additional cost spent on their initial investment to receive efficiency. This issue becomes specifically important for consumers considering alternative fuel vehicles. The basic definition of a payback period is the amount of time it takes to regain your initial investment. In the case of efficient vehicles it would be the additional cost incurred by buying a vehicle that runs off of alternative fuel rather than a conventional vehicle divided by the amount saved on fuel per year. Factors to determine the amount saved include: the difference between the new technology and conventional technology, price differences among fuels, and vehicle fuel efficiencies, and annual distance traveled. Some key elements that can cause the actual payback period to vary from the predicted are types of usage (highway vs. traffic) and actual miles driven. However, the most importantly, the payback period does not take into consideration the time value of money (present discounted value). When calculating a cost benefit analysis it is crucial to take into account that your money is worth more in the future. Otherwise, if a consumer reads that the payback period for a hyrbid is 5 years of a CNG vehicle is 8 years without considering the time value of time they underestimates the true economic benefits of their investment. Residential buildings are defined as detached and attached homes apartments and mobile homes. Growth in household wealth and other factors have spurred demand for larger homes and more energy services. Increasing energy consumption per household and increased saturation of appliances and equipment such as computer and entertainment systems has resulted in larger demand for energy, in particular electricity. The U.S. Department of Energy is tasked with setting standards for equipment and appliances in order to reach the maximum level of energy efficiency that is technically feasible and economically justified. The department attempts to establish standards that maximize consumer benefits and minimize negative impacts on manufacturers and other stake holders. Further, in 2008 the DOE released a schedule for setting new appliance efficiency standards, and a plan to address a rule making backlog in order to meet the requirements of the Energy Policy and Conservation act, as modified by the Energy policy act of 2005. State Energy offices can have an impact on efficiency though standards, incentives and efficiency programs. Utility companies, working alone or in consort with state energy offices, offer incentives for agency improvements and sponsor efficiency programs targeted at achieving peak load reductions. Tighter sate building energy codes have been a factor in the rise of residential energy efficiency. More new homes are being constructed to meet the target of energy efficiency programs, and 46% of new home buyers cite energy efficiency as a major consideration in their purchasing decisions. 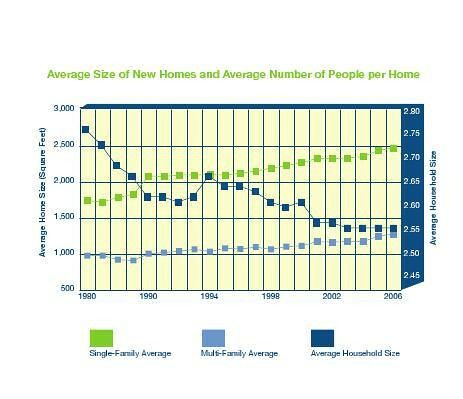 According to the DOE it is possible to design and construct new houses that are 30% to 40% lower in energy intensity than the typical house, at little additional cost. 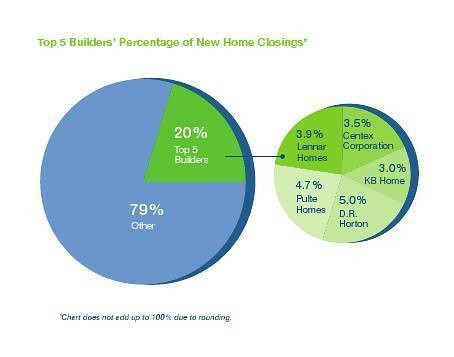 However, such homes still hold a very small market share. Sustainable Sites- Development on previously undeveloped land is discouraged in favor of locations w/ close proximity to urban centers as to avoid heavy reliance on transportation, and promotes the use of regionally appropriate landscaping. Water and Energy Efficient- Improved efficiency is generally achieved though the use of ENERGY STAR, or otherwise efficient appliances. Material and Resource Quality- LEED discourages the production of waste from and overly wasteful methods of construction, and promotes the use of locally harvested sustainable stock and materials. The uses of energy in this sector are equally diverse; common uses of energy include space heating, water heating, air conditioning, and lighting, refrigeration, cooking, and running a wide variety of other equipment. Furthermore, it is undisputed that every structure has unique and individual energy needs, but the most common sources used to satisfy those needs are electricity and natural gas. 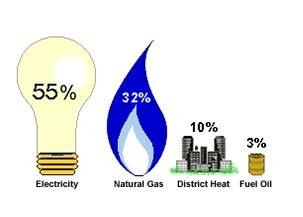 The Commercial Building Energy Consumption Survey (CBECS) noted in 2003 that electricity and natural gas account for more than 87% or 6500 trillion Btu of the total energy consumed in the commercial building sector. (This number does account for electrical losses) CBECS is a national sample survey that collects information on the stock of U.S. Commercial Buildings, their energy related characteristics, and their energy consumption and expenditures. The U.S. adds about 1.6 billion square feet per year – nearly 110,000 buildings annually at the mean size or roughly half a million buildings every five years. 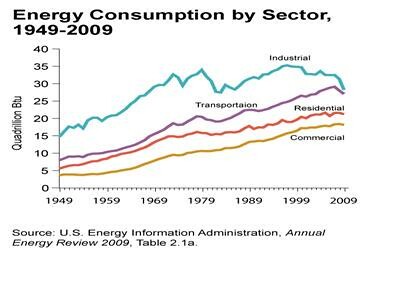 Projected growth rates of such sheer magnitude would seemingly directly correlate to increased demand for energy, but over the years the amount of commercial floor space has at times outpaced the increase in demand; therefore, the intensity of total energy use in decline. Since about 1999 however, intensity rates have been increasing at a slow, stable rate. This could be in part due to reducing energy use by means of efficiency and supplemental load reduction: A trend that is likely to be propagated by cost effectiveness and / or regulation. The Energy Policy Act of 1992 mandated the Department of Energy (DOE) to support the adoption and enforcement of energy codes in the states. 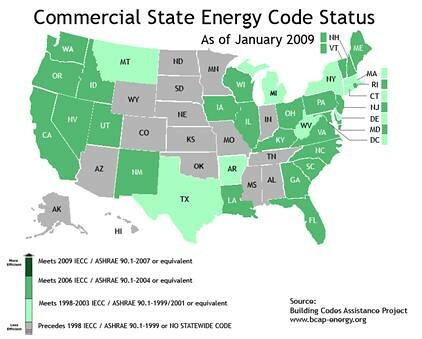 Furthermore, The American Recovery and Reinvestment Act of 2009 provided a new goal for DOE's building codes efforts - 90% compliance with energy code requirements for each state. Energy codes specify how buildings must be constructed or perform, and are written in mandatory, enforceable language. Standards are published by national organizations such as the American Society of Heating, Refrigerating, and Air-Conditioning Engineers (ASHRAE). Unlike many standards, the ASHRAE 90.1 is written in “mandatory enforceable language”. Energy use in commercial buildings is affected by the adoption of commercial energy codes: States or local governments adopt and enforce energy codes for their jurisdictions, and therefore vary greatly upon location. Currently, there are two primary baseline building energy codes and standards that are adopted by states and local jurisdictions - the International Energy Conservation Code (IECC), and the ANSI/ASHRAE/IESNA Standard 90.1 Energy Standard for Buildings Except Low-Rise Residential Buildings (ASHRAE 90.1). However, a separate set of codes and standards apply to buildings constructed or used by any Federal agency. The Commercial Building Initiative (CBI) was launched in August of 2008 by the Department of Energy’s (DOE) Building Technologies Program (BTP) as a government research initiative focused on improving the energy efficiency of new and existing commercial buildings in the United States. It is much like the aforementioned Building for America program aimed at residential efficiency. CBI focuses on two key areas. First, CBI is conducts research to dramatically improve the efficiency of existing buildings, in which the key focal point is identifying the most cost-effective retrofitting strategies that also improve the safety and comfort of existing buildings. Second, CBI is developing strategies to construct new, marketable buildings that achieve 50% to 70% whole building energy improvements, relative to ASHRAE Standard 90.1-2004. Develop targeted tools for measurement and verification of energy savings. As it has already been mentioned, LEED was developed by the U.S. Green Building Council (USGBC) and provides building owners and operators a concise framework for identifying and implementing practical and measurable green building design, construction, operations and maintenance solutions. It accomplishes this through a third-party verification system and is internationally recognized. In relation to the commercial buildings market, LEED provides a variety of distinct tools relating to building retrofitting and new construction. LEED Commercial Interiors (CI): for tenant improvement (commercial interiors) projects not involving an entire building. 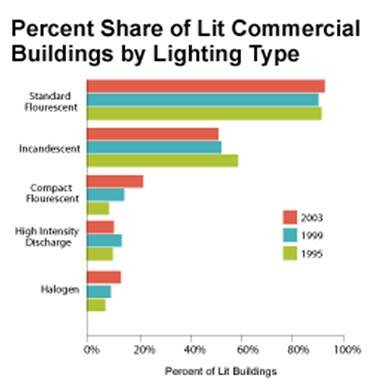 The percentage of commercial buildings with lighting was unchanged between 1995 and 2003; however, three lighting types did show change in usage. Compact fluorescent lamps (CFLs) and halogen lamps showed a significant increase between 1995 and 2003, while the use of incandescent lights declined. 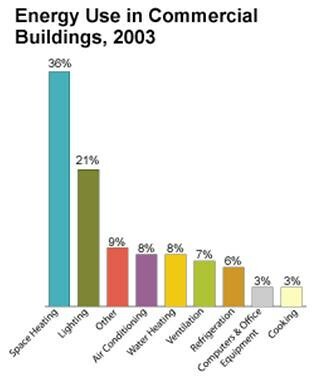 CFLs were used in twice the share of lit buildings in 2003 than in 1995, going from 10% to 20% of lit buildings. The use of halogen lamps nearly doubled, from 7% to 13% of lit buildings. Use of incandescent lights was the only lighting type to decline; their use dropped from 59% to just over one-half of lit buildings. In reference to the CBECS lighting usage data, the use of CFL lighting is quite popular and is increasing in usage despite the higher costs relative to incandescent lighting. Incandescent lighting has proved to be inefficient in terms of lifespan and watt usage ( 46 more watts used than CFL bulbs). Forced air systems can double for air conditioning and heating. A couple of benefits of forced air systems, which are now widely applied in churches, schools and high-end residences, are 1) better air conditioned effect 2) up to 15-20% energy saving, and 3) evenly conditioned effect. A drawback is the installation cost, which might be slightly higher than traditional HVAC system. Ventilation is the least expensive and most energy-efficient way to cool buildings. 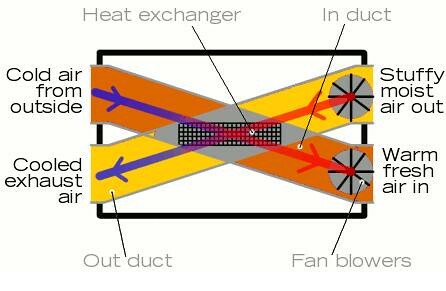 Ventilation works best when combined with methods to avoid heat buildup in your home; but there are technologies that specifically enhance ventilation and energy efficiency, such as an energy recovery ventilation system. This type of system provides a controlled way of ventilating a home by using a heat exchanger : They heat ventilated air in the winter by transferring heat from the warm inside air being exhausted to the fresh (but cold) supply air. In the summer, the inside air cools the warmer supply air to reduce ventilation cooling costs. The Environmental Policy Act of 2005 created the Energy Efficient Commercial Buildings Tax Deduction, a special financial incentive designed to reduce the initial cost of investing in energy efficient building systems via an accelerated tax deduction. HVAC/hot water and building envelope in the year the new equipment is placed in service, capped at $1.80/square foot. Alternately, the owner (or tenant) can upgrade one of these three systems to earn the Deduction capped at $0.60/square foot. Interior lighting may also be improved using the Interim Lighting Rule, which provides a simplified process to earn the Deduction, capped at $0.30-$0.60/square foot. Improvements are compared to a baseline of ASHRAE 90.1 standards. Also, The Commercial Buildings Tax Deduction expiration date has been extended twice, most recently by the Energy Independence Act of 2007 (EISA). With this extension, the CBTD can be claimed for qualifying projects completed before January 1, 2014. Energy is a fundamental component that is found in almost every good and service in the global market. The benefit to obtaining efficiency will help cut cost when using energy itself. 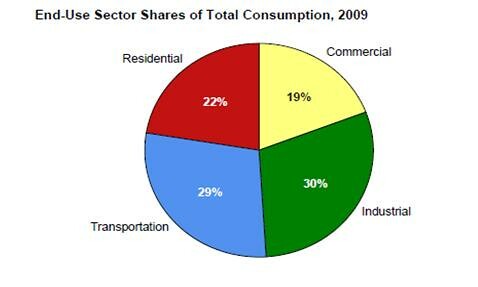 In the United States market, the industrial sector is a large fraction of consumption of energy. Addressing changes and welcoming innovation in technology in this market will lower the United States consumption thus making it more efficient. In order to reach energy sustainability, as a society we must take the initiative to strive towards efficiency by focusing on improvements and in the development of new technologies. With increasing energy prices and rising economic concerns that have surfaced it is vital to increase options in alternatives of energy sources. The concept of energy efficiency in the industry sector faces many obstacles that prevent potential progress in the development of energy efficient programs. To better understand the topic, industrial energy efficiency, it’s important for one to know the basic definitions that are associated with this aspect. New approaches need to address challenges that are focused on the long-term impact that it will have upon future society. Future developments as well as current ones depend upon efforts to improve industrial efficiency that center around manufacturing and the utilities sector. Focusing on patterns in the industrial use of energy will need to be addressed first. Better use of technology that requires less energy to perform the same tasks and functions will enhance energy efficiency. Improving industrial energy efficiency will lead to a reduction in national energy consumption. In the Industrial sector of energy there are many different uses and varieties in which energy is used. 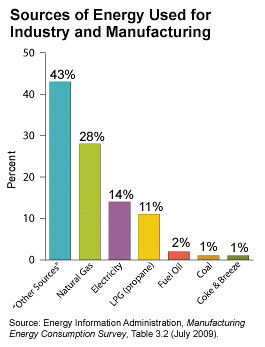 Other energy sources referred in the graph below show 43% of manufactures use of utilities such as heat, power and electricity generation. Also included in the “Other Sources” category are wood residues from mill processing, steam, pulp from liquor from making paper, agricultural waste, and wood-related paper-related refuse. One primary use is boiler fuel. Boiler fuel is the process in which in producing heat that is transferred to the boiler vessel to generate steam or hot water. This program assesses available technologies for improving energy efficiency and to encourage those technologies to be more widely used. By doing this they have to address the following questions: How does industry use energy? What has the energy trend been and where it appears to be going in the future? Once those concerns are met they can begin to take existing technologies to see how to improve industrial energy efficiency. In doing so, they must determine how much energy they can save. Cost effectiveness is the primary struggle in implementing energy efficient technologies for larger corporations. When energy use is cheap there is no demand to push for other alternatives. Obstacles that restrain operators from making changes are cost of downtown to implement new system, costs of capital, and retraining time. However, as energy rates rise those technologies will become more appealing as they become cost effective, ensuring the benefit will out weight the cost. The cost benefit will depend on the performance, reliability of the equipment and the incentives of switching to something new. 23. “Building Amrica: About Building America”, U.S.Department of energy, Retrived Oct 20. 2010. 24. 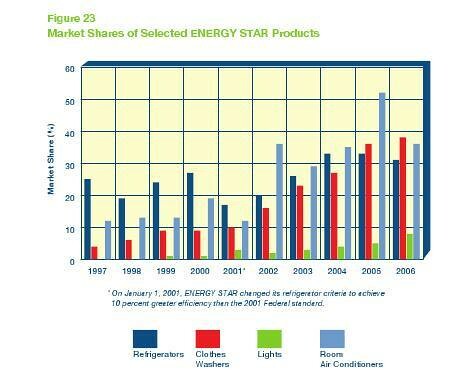 "History of ENERGY STAR"retrived from www.energystar.gov Oct 20, 2010. 25. "History of ENERGY STAR"retrived from www.energystar.gov Oct 20, 2010. 27. "Fact Sheet: The Environments for Living Program and Environments for Living Certified Green Programretrieved from www.environmentdsforliving.com, Oct 21, 2010. 28. "Fact Sheet: The Environments for Living Program and Environments for Living Certified Green Programretrieved from www.environmentdsforliving.com, Oct 21, 2010. 29. "What is LEED"retrieved from www.usgbc.org Oct 25,2010. 30. "What LEED Measures"retrieved from www.usgbc.org Oct 25,2010. 31. 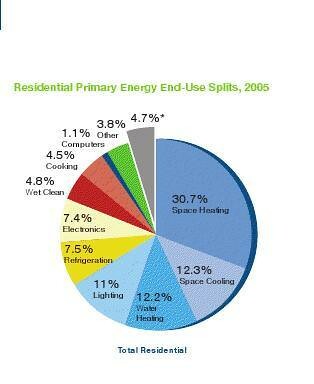 "The Marketing of Green Home Building"retrived from www.builderonline.com Oct 25, 2010. 33. "Sustainable Building Design Services"retreived from www.ehvacdesign.com Oct 25, 2010. 34. "ENERGY STAR"retrieved from www.energystar.gov Oct 25, 2010.